Working on Christmas Projects Yet?? If so, you’ll enjoy these ideas featuring our Holiday 2017 collections, starting with Laura Berringer’s FROSTY FLAMINGO. Laura’s a longtime fabric designer, and though she’s relatively to sewing and quilting, she’s quickly moving beyond her “Newbie” status ; ) We love her tropically festive holiday stockings with contrast cuffs! Then Brandy Browner took the “tropically festive” theme to another level with her imaginative interpretation – check out her realistic yet whimsical wing and beak accents – she drafted her own pattern pieces to achieve the look. And or course, we love Victoria’s own take on her GREEN AND RED collection, in her signature Double Wedding Ring design! Be sure to also mix in PRIMO PLAID FLANNELS, the WOOL COLLECTION and other basics for easy Holiday style. Whatever you celebrate, whatever you make — and whenever you start — Happy Holiday Stitching to All!! Victoria’s SIZZIX Maker Challenge Is ON! 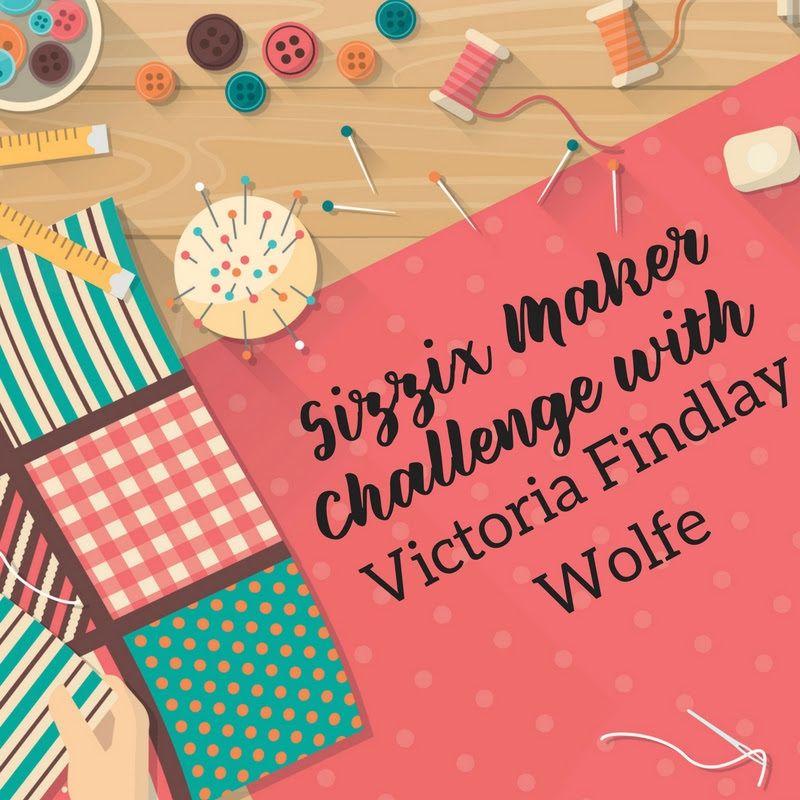 Check out the details of the current SIZZIX Maker Challenge, featuring the dies and fabrics of our own Victoria Findlay Wolfe! Grab your favorite Victoria Findlay Wolfe fabric from Studio 37 /Marcus Fabrics and choose at least one of Victoria’s dies, specified in the Challenge rules. Create a quilt that is greater than 16″ but smaller than 60″ square. Post it online at Sizzix by October 8th, when she’ll choose the winner! This lucky quilter will win not just one but TWO of Victoria’s brand new quilting dies (they’re a surprise!) She explains it all in this video… Good Luck to All! QuiltCon 2017: See You in Savannah! So, who’s joining us at QuiltCon in sunny (hopefully!) Savannah, GA next week? We’re proud to return again as sponsors, and we can’t wait to share all that’s new with you from Studio 37 Fabrics!! For now, here’s a sneak peek of what you’ll find at BOOTH 549! FREE Marcus WOOL Mini-Make-n-Take: Visit our sewing station to stitch up a cute little multi-layered bright wool embellishment. Inspired by penny rugs, these single “Wool Pennies” can jazz up a quilt, bag, or add a pin back for easy fabric jewelry. Thanks to our friends at Aurifil for supplying their cotton floss, and to Sizzix for their die cutting machine. On Thursday and Sunday, Sarah J Maxwell will share her favorite paper piecing tips and techniques as she stitches up blocks using her new DANDY DAYS collection and supplies from Paper Pieces! Looking forward to a fun and creative weekend — See you there!! We (Heart) Batik Valentine’s Mugrugs! First, I cut out a paper heart shape pattern to the desired size, plus about 1/4″ seam allowance all around. (If you’d rather not hand-cut your pattern, you’ll find about a zillion of them online, print out your favorite ; ). Using three tonal RADIANT REFLECTIONS batiks, I started stitching up a crazy quilt block directly onto the batting (I used Fairfield Soft & Toasty cotton batting), for an easy quilt-as-you-go construction method. I added fabrics randomly until the block was just larger than the heart pattern. I cut both the pieced block and a backing fabric from the heart pattern, and stitched them right sides together all around with a 1/4″ seam, leaving an opening to turn. Next, just turn and press, closing the opening with hand stitches or a narrow strip of fusible tape. Add a coordinating mug or teacup, a packet of cappuccino mix or some gourmet teabags, and a love note. Maybe a matching batik napkin for extra credit? Then, post your entry on Instagram using #MarcusMugshot, and remember to tag @marcusfabrics and/or @studio37fabrics for greater exposure! If you’re new to mugrugs, be warned: mugrug making can be addictive, which is really not a problem, because they make great gifts, AND you can enter as many times as you like (one mugrug per photo, please). Each Tuesday during the Challenge, we’ll choose random winners from the hashtagged entries to receive exciting fabric prizes and more — Join us!! See What Danyella Did with Meadow Storm! Today we welcome a guest post from Danyella Nava of Made Sew Modern – enjoy! I first met Victoria (Findlay Wolfe) when she came to Albuquerque, NM to teach a workshop that my local guild had organized back in June of 2016. I took her Double Wedding Ring workshop and totally fell in love with a classic technique! My first impression of Victoria was that she was such a fun, creative being, and I was so very excited to learn from her. My experience with Victoria did not stop there. I also joined her for a dinner and a lecture, and her deep love and passion for quilting continued to shine. I found that Victoria was incredibly humble. She was excited to share her knowledge with everyone and was open to conversation. I felt that she really took the time to get to know me by listening so intently over the few days I got to spend with her. Around the same time, Victoria’s fabric line, MOSTLY MANOR, had come out a few months before, and the quilt shop I work for had carried a few of the pieces from that line. The first thing I noticed about Mostly Manor was the bright and bold colors and how playful the prints were. It was one of my most favorite fabrics that we were carrying by Marcus, and I immediately knew I had to have some in my stash. When MEADOW STORM came out, it was no different. When I received a fat quarter bundle of the fabric, I just couldn’t wait to open it up and get started on something. I decided to give my first try at designing a quilt, and use this fabric for it. It definitely did not disappoint. I appreciated the quality of the fabric that Marcus Fabrics produces, it makes working with a new pattern very easy. In my opinion, it is always much more difficult when working with a poor quality of fabric. It was also so tough to choose a favorite! It was a tie between the black and white Manor Stripe I used in the border or the Sun Shower dots in orchid. I just absolutely love the boldness and richness of that orchid color! I have also found that it can be tough to find a really good black and white stripe, so I was jumping with joy when I got my hands on that piece. I even ordered extra just so I could keep a piece for myself! One thing that stands out to me about Victoria’s fabric lines is how well they play with each other. The quilt shop I work for also swooned over her fabric, so naturally we had to use her fabric lines to create kits that people could purchase. It was so incredibly easy to mix and match her prints between both Mostly Manor and Meadow Storm! I just love when fabric lines can be versatile with one another. I just can’t wait to get my hands on her newest line, LIGHT WORK, coming to shops this month! Was Victoria Upside Down, or Right Side Up? Those of you who subscribe to Marcus Mentions likely saw yesterday’s email and/or blog post on Victoria Findlay Wolfe’s MEADOW STORM release (shipping NOW! ), and her exciting feature in Traditional Home magazine’s October issue. Well, it turns out that some of you saw the magazine image inverted (in the email, on the blog itself, or both! ), while it appeared fine to others. It was correct in the preview I look at before publishing, so I couldn’t understand what happened. Last night, it occurred to me that in the afternoon, sometime between the scheduling of the post and its publish time, I received an email that WordPress had just initiated an update. I can only guess that somewhere in that process, a pre-edited version of the post went out, complete with the flipped photo, and its inversion might have also been caused by the terribly-timed update! — Look for MEADOW STORM, arriving in quilt shops now! — Pick up Traditional Home’s October 2016 issue to learn even more about Victoria – it’s also on newsstands now! Victoria…In Shops Now, AND in Traditional Home! And the timing couldn’t be better, not only becasue we couldn’t wait to bring it to you, but also because she’s also featured in the October issue of Traditional Home maagazine, which is also hitting newsstands now! In it, she shares her unique approach and personal inspirations. Check out Victoria on cloth, and in print!